European Council President Donald Tusk looks on during a news conference at a European Union leaders summit in Brussels, Belgium October 20, 2017. 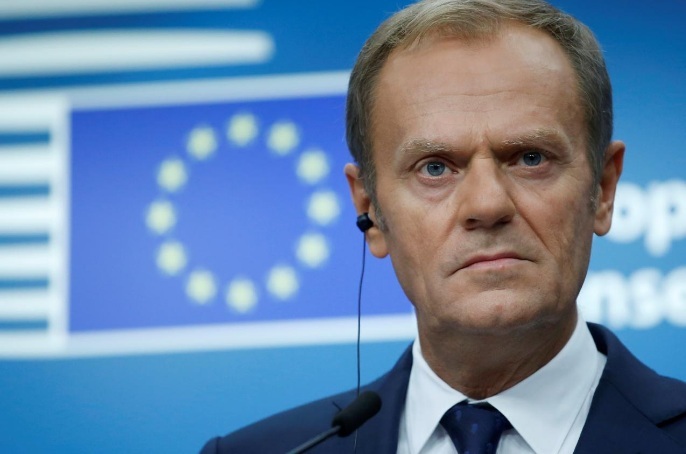 BRUSSELS - European Union countries still outside the euro zone should take part in euro zone reform preparations to show the unity of the bloc and the importance of the currency, the chairman of EU leaders Donald Tusk said. In a letter to Jeroen Dijsselbloem, chairman of Eurogroup of euro zone finance ministers, Tusk said he had called a summit on euro zone reforms on Dec 15th inviting all EU leaders except Britain, which is to leave the bloc in March 2019. “As the Eurogroup is charged with the preparation and the follow up to Euro Summits, I trust that you will adopt a similar approach for the preparatory Eurogroup meetings,” Tusk wrote in the letter, seen by Reuters. The summit on Dec 15 is to kick off the discussion on how to deepen the integration of the 19 countries now sharing the single currency, including ideas for a euro zone budget, a finance minister in charge of it and a euro zone parliament to which he would be responsible. There are also ideas of transforming the euro zone bailout fund ESM into a European Monetary Fund, setting up a sovereign insolvency mechanism and creating an unemployment insurance scheme or a rainy day fund. Officials also stress the need to complete the euro zone banking union by making the ESM a backstop for euro zone bank resolution and creating a scheme to protect all bank deposits up to 100,000 euros across the single currency area. European Union countries still outside the euro zone should take part in euro zone reform preparations to show the unity of the bloc and the importance of the currency, the chairman of EU leaders Donald Tusk said.